Hello! Good day to you girls! I have a couple things. Anyway, on off from this boring talk. So today I’m going to be talking about a super simple idea that maybe isn’t as well known as I first thought. Let’s admit it. We’re a messy bunch of people. Humans aren’t all that great at controlling and maintaining and leading and guiding and making choices etc. etc. We make messes. When it comes to any situation in life really, we are given a choice. We act on our knowledge, our intuition and thoughts and ideas and logic. And sometimes we act on our wants. Living life I’ve always been under this impression. Be careful when you make choices. Everything needs to be measured by God’s standards and guided with His will. A mess doesn’t result from seeking His plans. It never does. And so that’s how things go. Is this the right thing and the right way to do it though? First, we need to check out hearts. When we ask God to fix our mess what are we asking Him and how? Are we asking Him to look at this disaster and, please, make it all perfect again? Basically, are we seeking our plan or His will? Seeking God first in any situation (even the no-brainers!) is the best way to go always! But when we miss that step and turn to Him in the midst of our pile, we should have the right heart! It’s wrong to ask God to “fix this mess” when our hearts aren’t repented. When we turn to Him only to use Him as a genie in a bottle that will snap His fingers and everything will be breathable again that’s so wrong! Our God is an awesome God! He is all powerful and all knowing and Yes! He can fix your situation. Without hesitation He wants to help you. He loves you! But He also wants to teach you a lesson. When our hearts are not changed from a situation we have missed the point. When a baby touches a hot spoon, waves at a candle flame, or runs too quickly at the pool, it will learn a lesson from the pain, even when the pain was self inflicted. The same idea applies to our mistakes and hardships in life. If we haven’t learned our lesson (to trust God and obey His word) then commanding Him to fix this mess is absolutely a loss to everyone. If our hearts are right we are in a position of humility. Instead of wrinkling our noses and commanding God to pull us from this mess, we will turn to Him as a tired, pained child and instead of ask Him to show us what to do. The situation is delicate. Broken, hard. But there is no anger, no demanding attitude. Only a humble, repented heart. That is when the lesson has been learned and that is the right way to ask God when you’re in a mess. We need to understand a couple of things. First, that God is not a genie in our command. Second, He is all powerful and He loves us (as I already mentioned above! XD). Hard situations teach us to trust Him, and all the more when He doesn’t give us a life of ease as soon as we turn our eyes up at Him. He is teaching us something. We need to let Him teach it. Yes it’s ok to ask! For the longest time I thought asking God to fix a mess was wrong! I was under the impression that asking God to fix a mess was commanding. I’d gotten myself into this mess and I could ask for strength and wisdom and patience to get through it. I could not ask Him to pull me out and clean it up and fix everything. But it is ok to ask Him for help! The phrase itself is a sort of demand. But rephrasing it puts our hearts in the right perspective and it is just perfectly fine to ask God to help when you’ve gotten into a mess for yourself! God I’ve gotten into this mess, and I know it. I turn back to you, please show me what you would have me to do now. He will. He is so so faithful! He will NEVER leave you, no matter how big a mess you’ve gotten, or how small, or how totally devastating it is, or how big of a rebel you’ve been. He is ready in every moment to wrap you in His arms and show you what to do now. God never fails to guide us in any place or situation or setting or time we are in. If our hearts are in a place of humble surrender He is the Father of the prodigal son, running to us. Dressing and providing for us. That’s why He sent His Son for us while we were yet sinners. The Creator sent Jesus to earth to die for our sins while we were still spitting at Him so that the moment our hearts cry out in repentance He is able to take us under His wing and into His home and guide and guard us. A humble heart with Jesus is a key to God’s plan. There is nothing better than that. As a sort of side note I wanted to mention that the phrasing of a sentence doesn’t matter to God. You can ask Him to please fix this mess with the most humble and surrendered of hearts, just like you can ask Him to guide with a prideful and rebellious one. The point here is your heart and your mindset on God. The way we phrase our sentences and pray can often give us a hint as to where we stand with Him in our hearts, but it’s not a concrete determination. 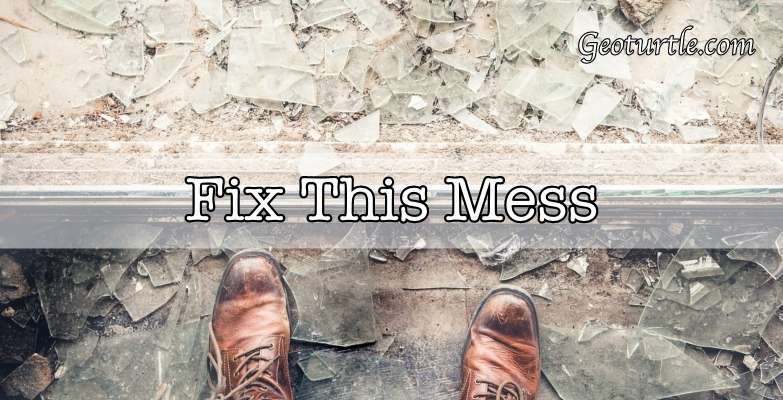 Asking God to fix a mess is not a sin, but demanding He do it your way with your outcome is.